Ever wonder what to take to a casual get-together with friends that’s not the same old, same old? We were assigned “side dish” duty for a little gathering not long ago. I was determined not to purchase anything because we already had a refrigerator full of produce–including a bag of baby Yukon Gold potatoes. Roast them? Meh. Boil them? Double meh. I needed something impressive that would transport well and be easily reheated or kept warm. Voila! 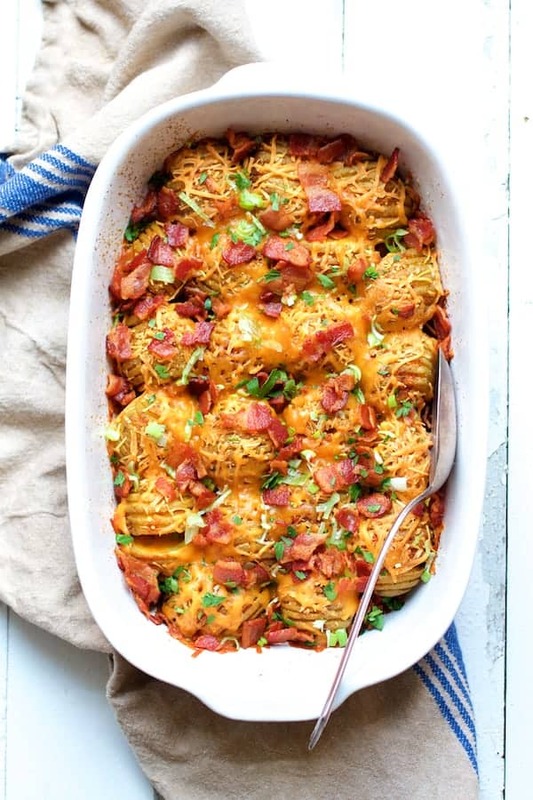 Baby Hasselback Potato Bake with Cheddar and Bacon was born! 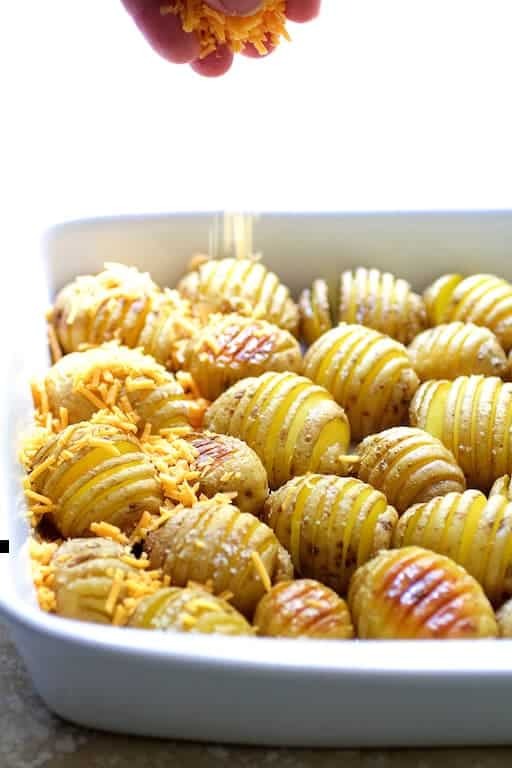 Hasselback potatoes are named for the Swedish Hasselbacken hotel where this preparation became popular back in the 1950’s. They remain popular to this day. I roasted the potatoes at home, popped them into a baking dish, then placed the dish in a small cooler to keep warm on the drive over. (Yes, coolers also keep things warm.) When we arrived at our friend’s home, I topped with cheese and bacon and borrowed their oven to melt the cheese. They were a hit! The most difficult part is slicing the potato without cutting all the way through and cutting far enough so they “fan out” when baked. Here’s my high-tech solution: Chopsticks and duct tape! Duct tape fixes just about everything, doesn’t it? 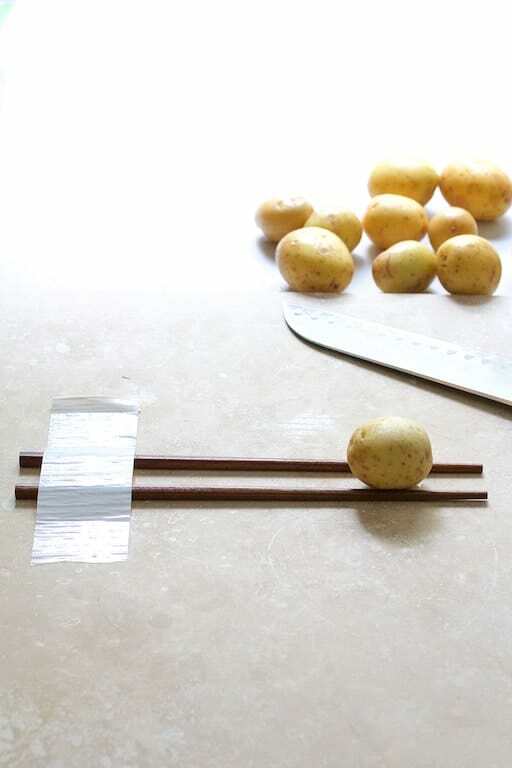 You’ll need to be careful when slicing the ends of the potatoes. However, if you accidently do slice off an end, it won’t be noticeable when you place them in a baking dish. Ta-daaah! 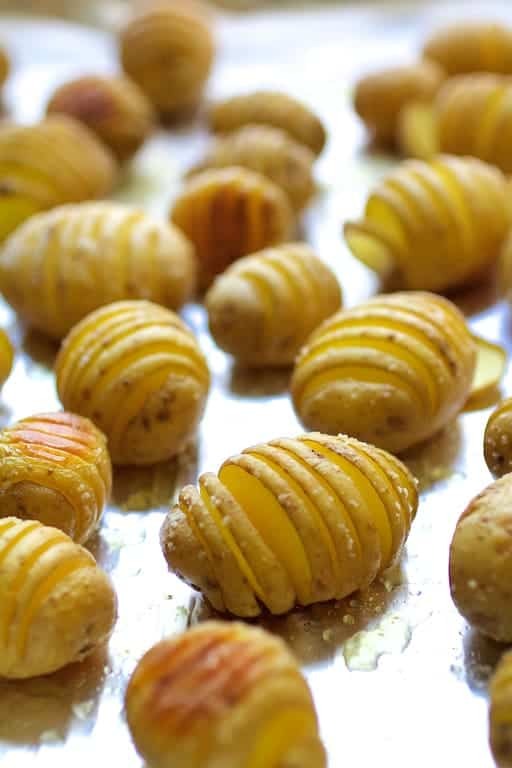 Baby hasselback potato cuteness! 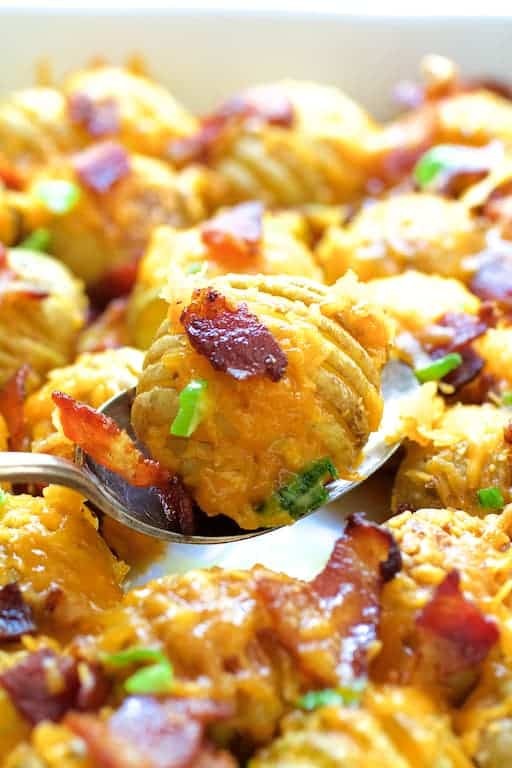 If you were going to serve these as an appetizer, you would have to be particular about how you sprinkle on the cheese, the bacon, etc. Serving this way, you can just sprinkle on the cheese and bacon and you’re good to go! 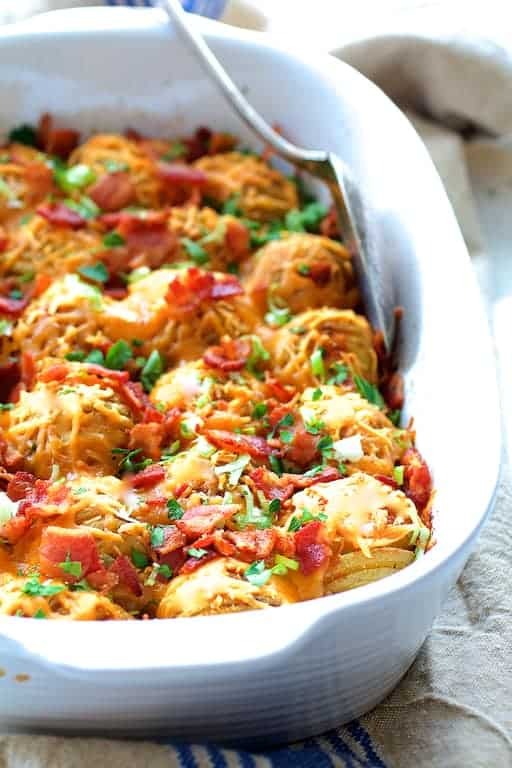 Cheesy, bacony potato goodness! Mwaaaahh! Preheat oven to 375 degrees. 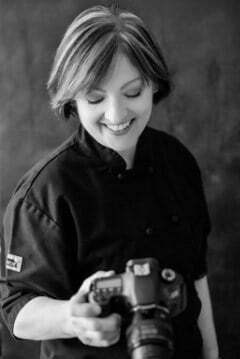 Butter, oil or spray an 8 x 11-inch baking dish. 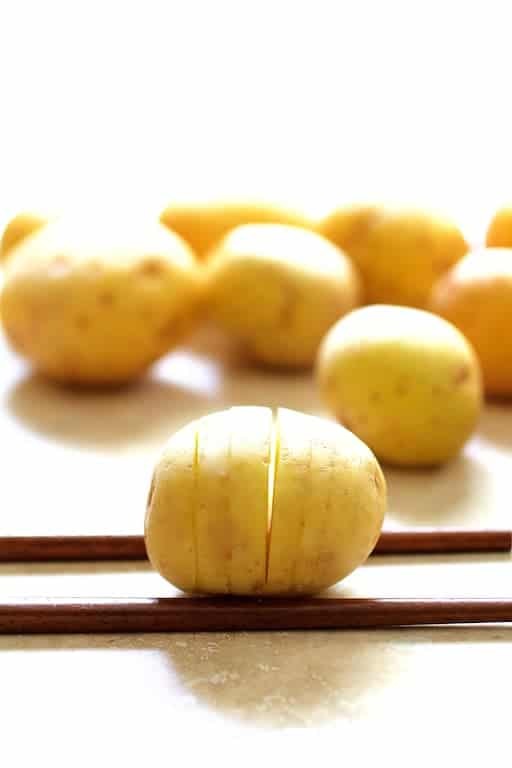 Cut slits in each potato, leaving the bottom intact. Stop just before reaching the bottom of the potato. Space the slices 1/8-inch to 1/4-inch apart. Set on a baking sheet, drizzle with olive oil and season generously with salt and black pepper to taste. Roast for 45-50 minutes or until the potatoes "fan out" slightly and are tender. 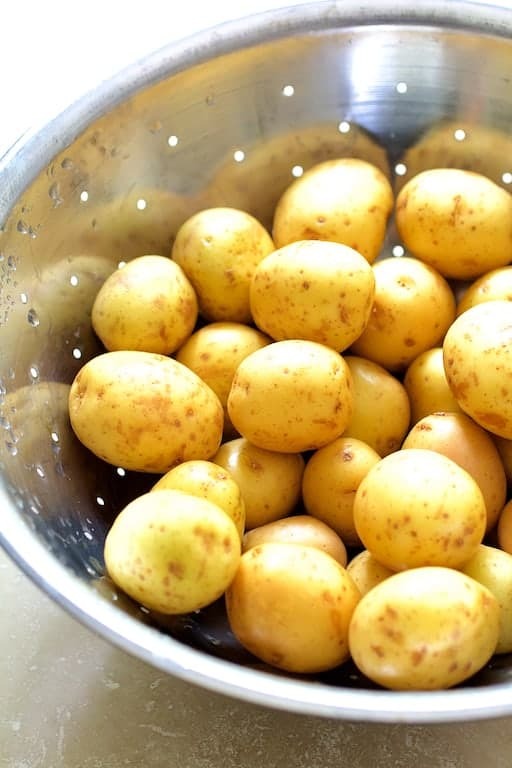 Transfer potatoes to a baking dish. The potatoes should be snug but not so snug that you close up the potatoes. 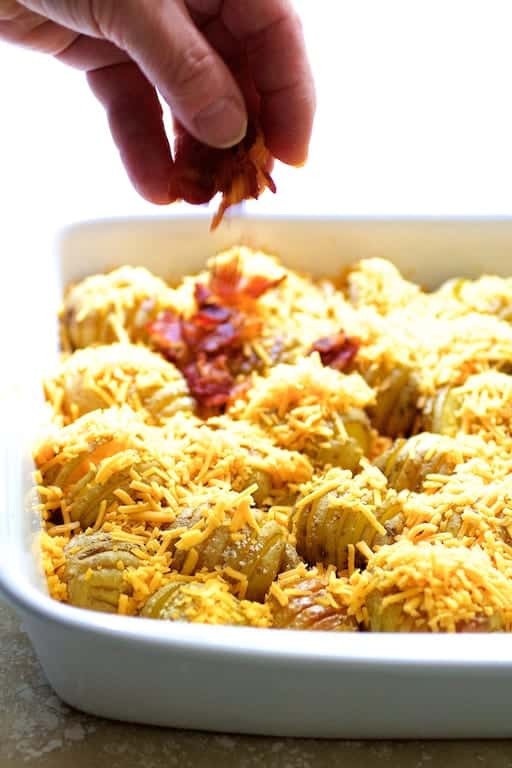 Sprinkle with cheese and bacon and return to oven to 10-15 minutes or until cheese has melted. Sprinkle with scallion tops or chives and serve immediately. 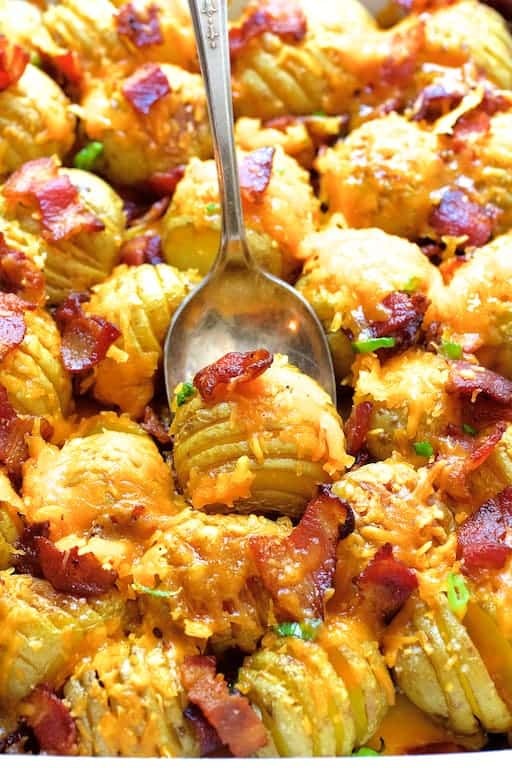 Love your mini version of hasselback potatoes and they would certainly travel well. 15 minutes in the oven to finish off is very doable no matter what else might be happening in the kitchen.